Our customers' favorite dahlia collection, 8 different varieties and colors, all dinner plate sized flowers. Our number one selling dahlia collection, incredible rainbow of 8 distinct dinner plate dahlias that bloom profusely in summer till frost. Visitors to your garden will be taken back by the largeness of the flowers and the incredible detail and clarity of each flower. Most gardeners mass plant the collection, creating a living floral arrangement in your garden. 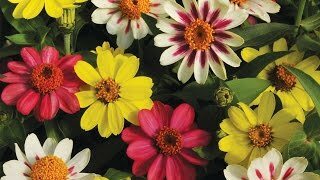 Exceptional cut flower for an arrangement, either as a single flower or mixed with smaller complimentary annuals or perennials. Dahlia, Dinner Plate Collection 1 & 2 is rated 1.0 out of 5 by 1.